(Nanowerk News) In a dark, starless patch of intergalactic space, astronomers have discovered a never-before-seen cluster of hydrogen clouds strewn between two nearby galaxies, Andromeda (M31) and Triangulum (M33). The researchers speculate that these rarefied blobs of gas -- each about as massive as a dwarf galaxy -- condensed out of a vast and as-yet undetected reservoir of hot, ionized gas, which could have accompanied an otherwise invisible band of dark matter. The astronomers detected these objects using the National Science Foundation’s Green Bank Telescope (GBT) at the National Radio Astronomy Observatory (NRAO) in Green Bank, W.Va. The results were published in the journal Nature ("Discrete clouds of neutral gas between the galaxies M31 and M33"). Astronomers are able to observe neutral atomic hydrogen, which is referred to as HI (H and the Roman numeral one), because of the characteristic signal it emits at radio wavelengths, which can be detected by radio telescopes on Earth. Though this material is abundant throughout the cosmos, in the space between galaxies it can be very tenuous and the faint signal it emits can be extremely difficult to detect. A little more than a decade ago, astronomers had the first speculative hints that a previously unrecognized reservoir of hydrogen lay between M31 and M33. The signal from this gas, however, was too faint to draw any firm conclusions about its nature, origin, or even certain existence. Last year, preliminary data taken with the GBT confirmed that there was indeed hydrogen gas, and a lot of it, smeared out between the galaxies. These preliminary observations, however, lacked the necessary sensitivity to see any fine-grain structure in the gas or deduce whence it came and what it signified. The most likely explanation at the time was that a few billion years earlier, these two galaxies had a close encounter and the resulting gravitational perturbations pulled off some wispy puffs of gas, leaving a tenuous bridge between the two. New and more thorough studies of this region with the GBT, however, revealed that the hydrogen gas was not simply in the form of wispy streamers, as would be expected by the interactions of two galaxies in a gravitational ballet. Instead, a full 50 percent of the gas was conspicuously clumped together into very discrete and apparently self-gravitating blobs that – apart for their lack of stars – would be dead ringers for dwarf galaxies. Dwarf galaxies, as their name implies, are relatively small collections of stars bound together by gravity. They can contain anywhere from a few thousand to a few million stars. The researchers also speculate that these clouds may represent a new and previously unrecognized source of neutral hydrogen gas that could eventually fall into M31 and M33, fueling future generations of star formation. The GBT, because of its enormous size, unique design, and location in the National Radio Quiet Zone of West Virginia, was able to detect this signal, which was simply too faint for other radio telescopes to detect with precision. “The GBT is unique in this regard,” said Lockman. Astronomers are also interested in these cold, dark regions between galaxies because there is a great deal of unaccounted-for normal matter in the cosmos, and a significant fraction may be contained in intergalactic clouds like the ones observed by the GBT. 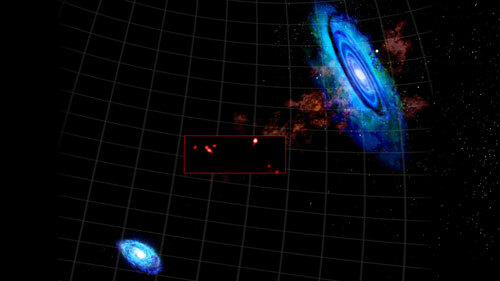 Further studies of this region and around other galaxies in our Local Group (the galaxies found relatively close to the Milky Way) may yield additional clues as to the amount of hydrogen yet to be accounted for in the Universe.